The Peep Hen is, after all, quite a small boat; it was interesting, this summer and fall, to find out a little bit more about what works, and where the limits start to show, for this design. SERENITY is out of the water now (photos from the nice day we had hauling it are coming sometime soon) and I’ve been reflecting on what I learned in these last months. In average conditions, the Peep Hen does fine. 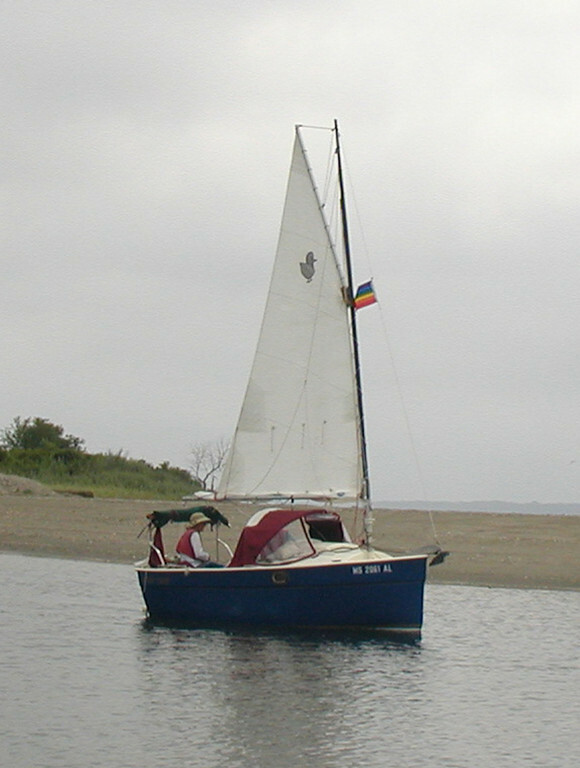 It is sturdier than most boats its size, because of the ballasted keel, and is very dry, and generally a lot of fun. Then there are the considerations that come up when the wind and/or water are something other than average. There are three main categories for the new information gained: tacking in less than ideal conditions; strong wind that is gusting and shifting; and drying out on soft surfaces. This post will address tacking, with each of the other issues appearing in their own blog entries over the next few days. Learning to tack this boat reliably has been fascinating. Many thanks to folks on the Hensnest Yahoo group (https://groups.yahoo.com/neo/groups/Hensnest/info), who offered crucial advice after a day when I had troubles in stronger wind and a steep chop, finding it impossible to get the boat to go about. This was only sorted out by turning all the way around in a circle and jibing; the boat was on thin ice as far as its happy home, by the end of that experience. But as so often, this had more to do with the operator than the boat. There are several strategies which help with tacking that I was already using: watching the waves for the least disruptive moment to turn; picking up speed before going about; and shifting weight across the boat to leeward as the turn is being made. Additionally, in general it’s a good idea to put the tiller only partway over, letting the rudder do the job of turning without being far enough to the side to act as a brake; I was doing that gentle turning too. Having one sail and a centerboard has been new for me, and this is both a big source of the problem, and where all that good advice has been particularly helpful. I have now learned that, first off, letting the centerboard all the way down provides a better pivot point for the boat, which helps it to turn. Second, when the sail is sheeted in tight it will help the wind to push the back end of the boat around. The nuances of this second adjustment only became clear gradually. The Peep Hen has a boom gallows, that wooden bar above the back end of the cockpit, supported by a couple of poles and some bracing. (On my boat this is lowered to match the original drawing – on most production Peep Hens it’s taller, which might or might not interfere with the boom coming across the cockpit. It’s also pretty much wrapped up in the stowed green cockpit awning, in the photo below.) One of the bonus advantages of either version of this gallows arrangement is that it provides a very accurate reference point for the position of the boom relative to the centerline of the boat. 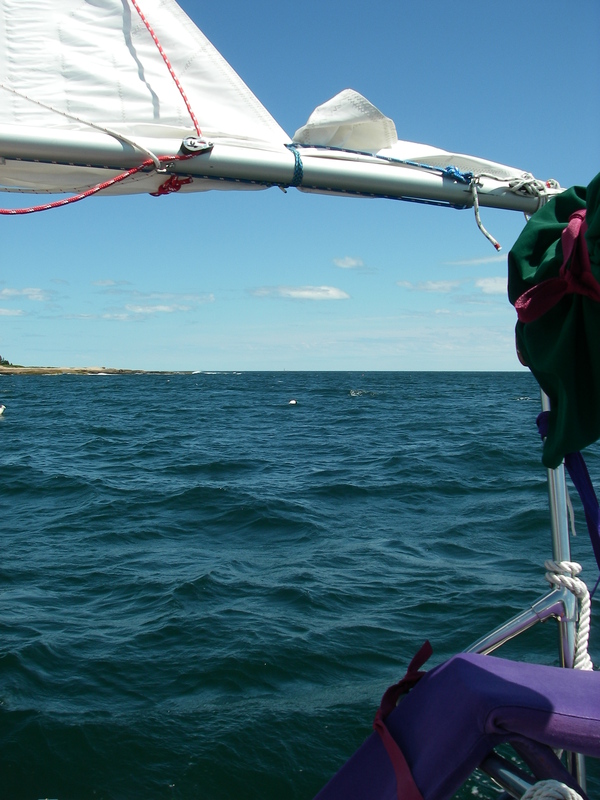 Ordinarily, when sailing upwind it is my habit to keep the boom adjusted 3 or 4 inches to the outside of the gallows. If you sheet the sail in too tight, the sail looks great, but boat speed is seriously diminished. The outside position seems to work as the best compromise for upwind progress. After receiving all the great advice from the Hensnest folks, a few days later I was again out in windy and choppy conditions, sailing upwind and needing to tack. I put the centerboard all the way down, and was delighted to find that tacking worked like a charm, every time. This was vastly different from the previous round, and led me to believe that the centerboard position was doing the whole job. Because I was sailing alone and it seemed like a lot to manage, I did not try pulling in the sheet as I was going about, and was quite happy to see the whole business work without that extra step, repeatedly. Some time later, different day, more wind, more waves, I confidently made sure that the centerboard was all the way down, went to tack, and failed, falling back on the original tack. Fortunately this was not a problem, with the shore at a good distance. Three more tries, still no successful tack. 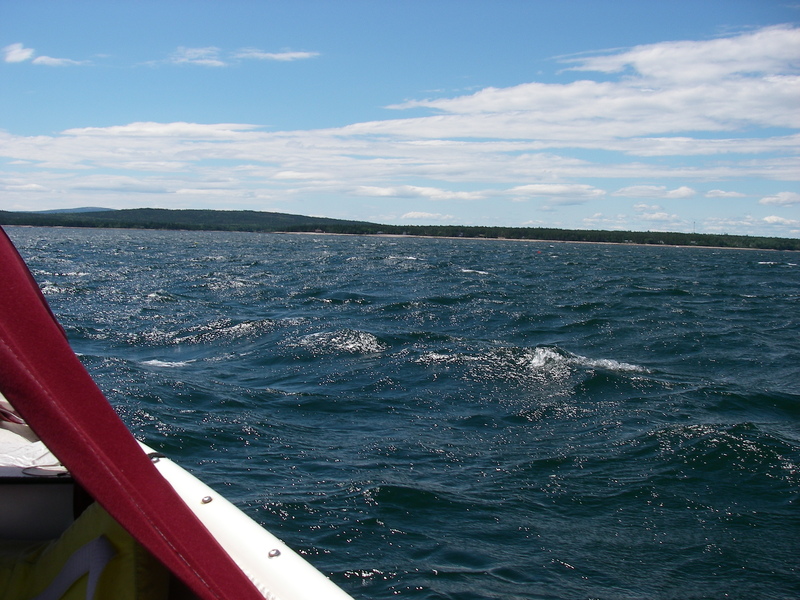 The waves were fairly large, and chaotic, in the oversize tide rip that happens at the north end of Penobscot Bay between Stockton Springs and Castine, with a good strong wind of 15 to 20 knots, against the tide. Not that I would do that twice! As this non-tacking was going on I was reflecting on those various bits of Hensnest advice, and eventually realized that because of the hefty wind, I was sailing with the sail adjusted farther out than normal, so that it would be luffing a little bit. There was already one reef in, and that bit of luffing made the boat more manageable, especially in the gusts. The sail was out about 6 inches farther than usual, which in the grand scheme of things is not that much. Still, adjusting it closer in was worth a try. In came the sheet, bringing the boom to its more customary position, and next try the boat turned through the wind as if it always did that. And every time after, in that same chaotic wind and waves. Just a few inches of adjustment made all the difference in the maneuver working or not. With all of these strategies, the Peep Hen has become a boat that tacks reliably. I’m delighted to not be using the motor to assist with failed tacks, which is what I used to do in those trips a few years ago. Even the designer has been quoted as saying that it’s good to keep the motor running for sailing upwind in this boat. Having to do that was going to be a dealbreaker these days, perhaps sending the boat to a new home, and I’m very happy to find that it doesn’t have to be the case. Originally, in taking the Peep Hen out I missed having a second sail, whether jib or mizzen, particularly for making turns. Over these last months it feels like I’ve become a better sailor, understanding more clearly what drives the boat; I’m looking forward to seeing how this new understanding opens up possibilities for more nuanced sailhandling, when next I’m out in a boat with more than one sail! Fascinating! You are certainly getting the most out of an odd out interesting little craft. I hope we can get you out on a real catboat sometime. Think you would like it..
That sounds like a wonderful thing to look forward to, as the snowflakes come down. The last time I was in a real, traditional catboat I was a teenager, out with a couple of friends in their boat. That was quite a while ago! It would be lovely to get a feel for how the real thing works, from this vantage point. In the meantime, I hope that SHOREBIRD got through the hurricane okay, and that you are out enjoying all those nice catboat characteristics. Hey Shemaya, it sounds like perseverance and some sound advice has paid off nicely. Well done. Thanks – it’s been fun. It’s interesting about the maneuver you described. My friends in Alaska – the Triloboats folks – use this same maneuver routinely. I’ve tried, but so far have not gotten the hang of it, having it work occasionally, but not reliably. Reading your description it occurred to me that I really had not grasped that the point of holding the sail across the boat upwind is not trying to drive the bow around, but trying to specifically get the boat moving backwards. Come spring, I think I might get somewhere with it, having this better grasp of the process. It’s comforting to know that even accomplished sailors sometimes have trouble getting the boat to turn. Reminds me of a windy day in an O’Day 12 (also one-sailed and high-sided) almost 40 years ago. After failing to get it to tack, I finally pulled up the centerboard, drifted onto the beach, got out and turned it around. Maybe there is some cool sailing jargon for that maneuver.